Aaron Butler was brave. Courageous. Selfless. His character was the definition of loyalty, duty and honor. As a Special Forces Green Beret, he was trained to expect the unexpected. But in a split second, a booby-trapped building in Afghanistan would kill Staff Sergeant Butler and injure 11 other members of the National Guard. Two weeks ago, he paid the ultimate sacrifice for his country. A beautiful service was held in Monticello, Utah this past week. 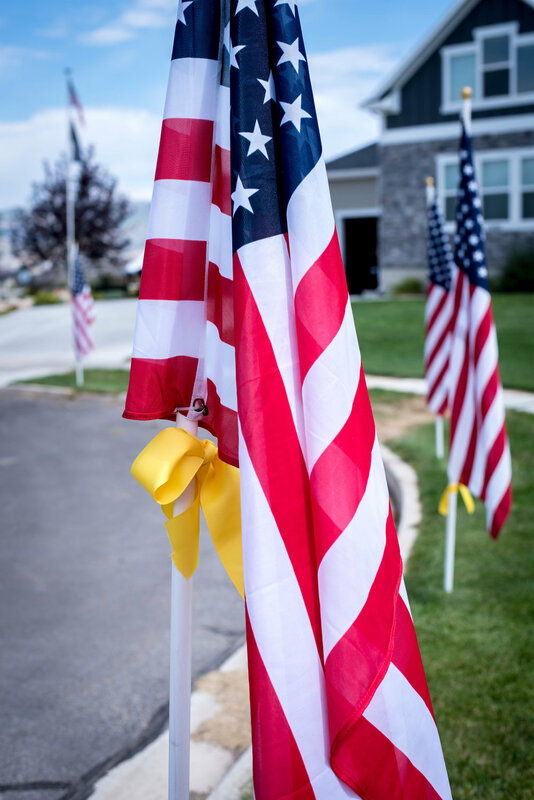 Aaron was recognized and remembered as his family and fiancé became a Gold Star family. It is customary for black ribbons to be tied to poles and trees symbolizing a fallen soldier. His family made an emotional request. Tie yellow ribbons instead of black. Because Aaron has returned home to his Heavenly Father. Today the family will travel back to their homes and jobs and attempt to move forward in life. One member of that family is Adam Butler. He is Aaron’s brother. Adam recently rented a place in Heber City, Utah. He is an EMT for Park City Hospital. There is no family in Heber. Just a basement apartment and a place to call home a short distance from work. Yesterday, a group of mothers received word that Adam would be returning to Heber today. A few phone calls were made. Requests to help recognize this brother’s grief. Word spread … and spread. Churches and scout troops donated all their flags. Moms and Dads and kids set their alarms early to get those flags up at sunrise. Families volunteering to welcome Adam home and to let him know his brother Aaron was remembered. Yellow ribbons. There weren’t enough at the local Walmart so they purchased yellow tablecloths and cut them into strips. Yellow strips which delivered a message. Businesses and shops on Main Street also displayed flags and ribbons. A gesture first noticed when Adam drove into the community. Heber City owns a giant flag that can be displayed over Main Street. It is held in place by an extension ladder from the community’s prized fire truck. It is only displayed on special occasions. When the city authorities got word of Adam returning home today, they quickly decided this was one of those events. 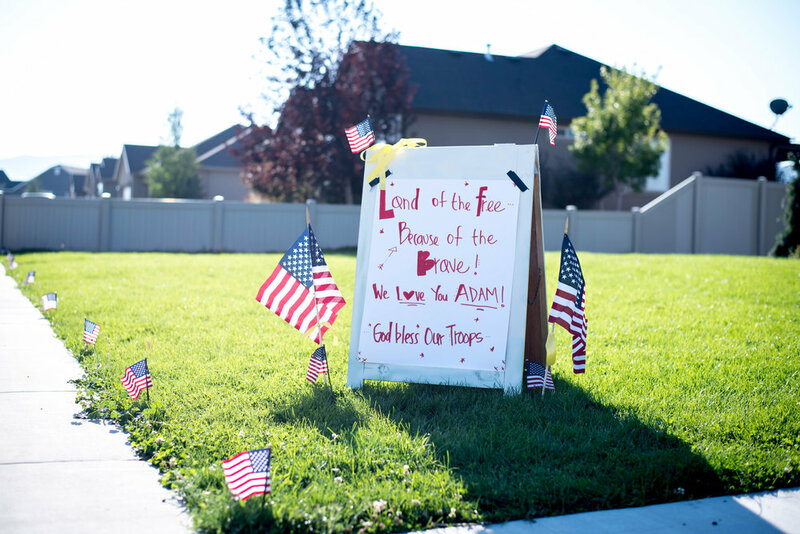 But this time the truck drove to Adam’s street and hung the stars and stripes over the entrance to his street. The sheriff department showed their support. Officers in uniform there to give thanks and condolences to Adam. 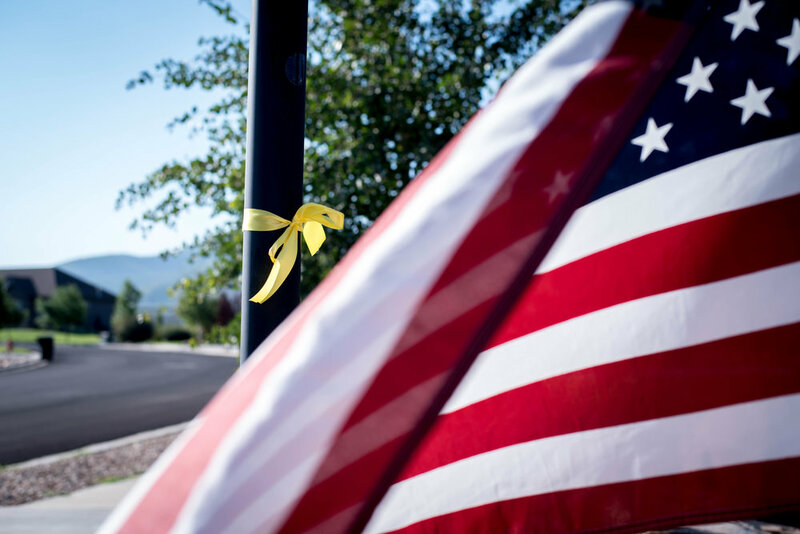 A small, patriotic town gathered in the wee morning hours building an atmosphere to welcome a new resident they had never met and pay tribute to his fallen brother. Mothers holding babies in their arms and young children by their side. Teaching their young children about honor. About sacrifice. 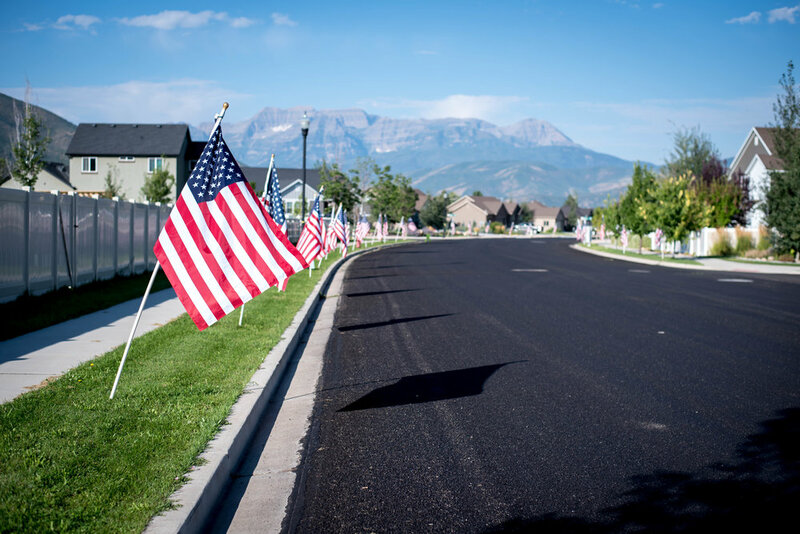 Remembering that their beautiful town is home of the free because of the brave. This is what patriotism looks like. This is what loving your neighbor looks like. This is what it means to serve others – even those you have never met. And this is what it means to become a little more like Him. In Heber City, Adam arrived home today to open arms, soft hearts and love. Aaron had the same experience.